My fiance and I are rather fond of Forbidden Planet and try and pop in whenever we're up in London together. Since we have little in the way of impulse control though, that usually ends with us weighed down with more than we really intended to walk away with. Hence where this trio of books comes in. A set of books that combine Sun Tzu's Art of War with classic fantasy tropes was a prospect too enticing to pass up on. Perceptive readers will notice that I have grouped the Orcs War Fighting Manual, the Elves War Fighting Manual and the Dwarves War Fighting Manual into one review. The reason behind this is that structurally they are practically identical, so there seemed little point in reviewing each one individually. They are presented as the translations of Orcish, Elven and Dwarven texts on military strategy and philosophy by a human anthropologist. 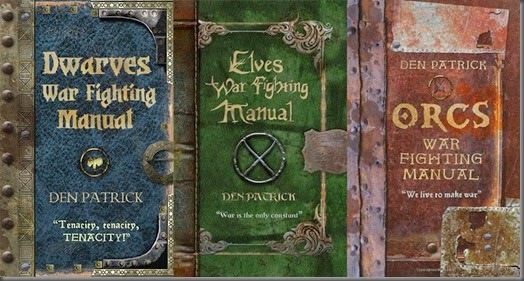 They all cover subjects such as weaponry, armour and formations, as well as having one chapter focusing on a particular cultural aspect of warfare: for the Orcs this is the role of the shaman, while the Elves have a chapter focusing on magic and the Dwarves get a section dedicated to siege tactics. I'm in two minds about these books. On the one hand, they are pretty predictable when it comes to creating a feel for how these cultures present themselves. Orcs are aggressive and generally not too bright. Elves are beautiful and cultured, but supremely arrogant. Dwarves are incredibly self-reliant and stubborn. Humans are seen as rather pathetic by all three. Really, it doesn't tread much in the way of new ground when it comes to characterisation. On the other hand, it covered this material with a surprising amount of humour and depth for such short books. The trio is as much an exercise in world-building as it is a look at military tactics within a fantasy setting. There is history about where grudges between races originated from, a surprising amount of information on the non-corporeal beings that threaten all three races and hints about a potential bigger threat that could further endanger all three races. I'm kind of surprised that these books aren't part of a bigger series, as there's a lot that you could build on. It's really quite impressive, even if you only get a fraction of whatever preparation must have gone on before putting pen to paper.